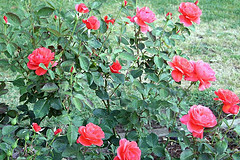 Rose bushes are susceptible to many damaging insects, including the rose midge larva, rose cane borer, stem girders, thrips, aphids, Japanese beetles, sawflies (or rose slug), mites, scale insects, caterpillars, and rose chafers, to name a few. There are several options for controlling these pests. It is important to properly identify the correct insect. If you intend to be an avid rose gardener it would be beneficial for you to pick up a rose insect identifying book at your local bookstore. You may also want to invest in a 20X hand lens to observe small insects, especially those on the undersides of leaves. Once the pest is identified you can then determine how bad the damage is. 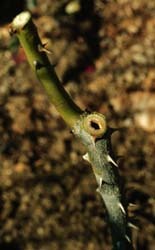 If there are only a few pests within your rose garden (about one to two per plant) consider just picking them off and killing them yourself. Or, you could hose them off with a strong stream of water. Be sure to pick off the leaves which contained the insects because they could harbor eggs or larvae. You may be able to prevent destructive insects in the first place with biological control, or insects that are natural enemies to the pests. 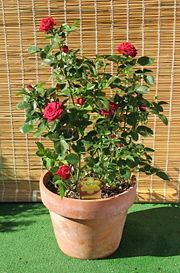 You will need to find a distributor, either from the Internet or a local garden center. Follow the appropriate instructions for the timing of the release, how many to release, and how to store them if necessary. Another approach is to use natural or synthetic chemicals. 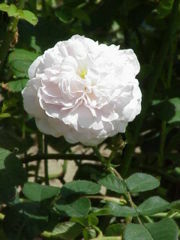 Both may be obtained at your local garden center or ordered on-line. It is important to follow the labels for any application, even those that are “organic” or “natural” because the ingredients are in a concentrated form and can still be toxic to people if improperly used. Keep in mind, the label is the law! Interested in other types of bushes? You might want to take a look at holly bushes, our other website about bushes that we have at our home.